Below is a photo of me with my friends Kazuo Kubo and Take Gima. We spent a Saturday together when my wife, Wei Wei, and I were in Tokyo, on the first part of our Japan-Okinawa-Taiwan trip. Take, who is sitting on my left, graduated with me from the University of Hawaii at Manoa. Originally from Okinawa, he spent his career in the Tokyo area as a design electronics/computer engineer and executive in the industry. Photo 1. 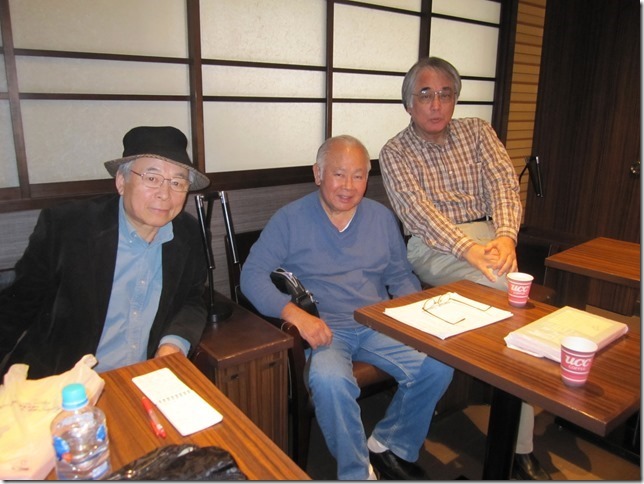 A photo of me with my friends Kazuo Kubo and Take Gima in Tokyo. Take is retired, but as a consultant, he says he does more work now than he ever did before he retired. The Inafuku family owes him a lot. 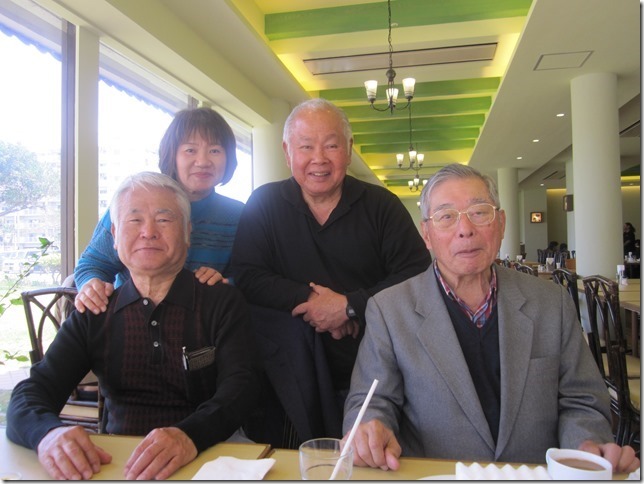 When my dad asked me to contact my cousin, Yasuo Inafuku, in Okinawa, I went to Take for help. He not only found my cousin’s address and phone number, but he called him up! Also, Take is my source for questions about Uchinaaguchi (Okinawan language, or Hogen) since he speaks it fluently. He told me he couldn’t understand why I felt that Uchinaaguchi was becoming extinct because he and everyone in his family, and all his friends in Okinawa, use it all the time. When he goes back to Okinawa to visit, that is what they speak. Kazuo is a mechanical engineer by profession who once worked for IBM in Tokyo. He, too, is retired but is working on some designs, which he plans to patent when completed. He told me he has a machine shop at home where he can build the prototypes. When Wei Wei and I were at a shoppng mall in Fukuoka, we ran into some cute junior high school kids on a Yomitan Okinawa softball team. 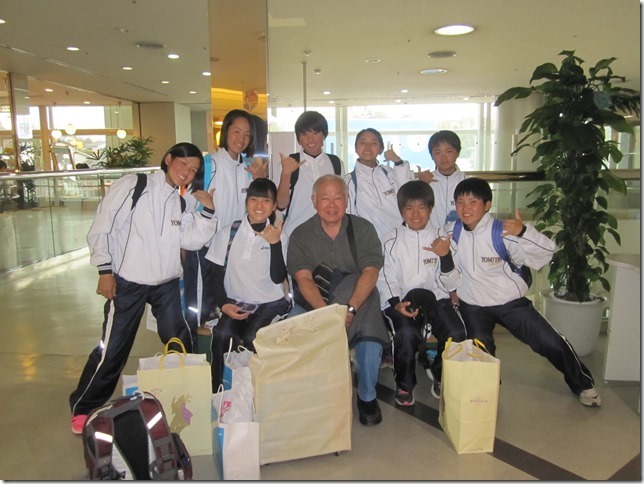 They were participating in a tournament in Fukuoka. Since my China cousins’ family on their dad’s side came from Yomitan, I asked if any of them were Chinas. I got only blank looks. We saw them again at the airport when we were leaving Fukuoka, but they boarded a different plane. Photo 2. At a shopping mall in Fukuoka, my wife, Wei Wei, and I ran into some cute junior high school kids on a Yomitan Okinawa softball team. When our plane landed at Naha Airport, I was so surprised to see Choko Takayama there with Yasuo and his wife, Aiko, to greet us because I know that Choko is a very very busy man. Choko is a former deputy mayor of Naha, deputy director of NHK in Okinawa, and current president of the Hawaii-Okinawa Association. I felt so honored that he took time out of his busy schedule to greet us at the airport. I have to thank Yasuo for Choko’s presence. They were friends in Taira village in Haneji small kid time. Photo 3. 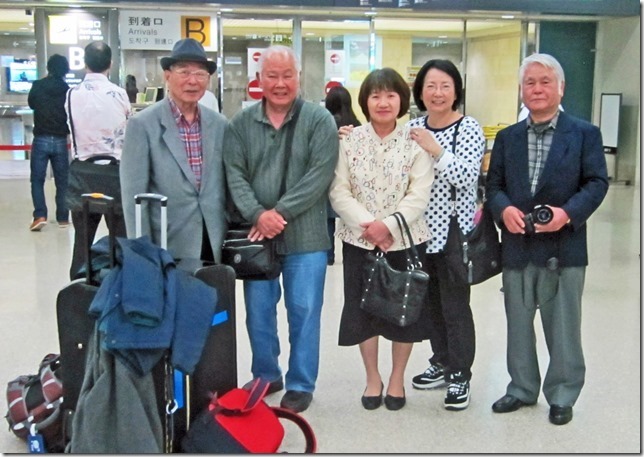 When our plane landed in Naha, Okinawa, Wei Wei (2nd from right) and I were so surprised to see Choko Takayama (far left) there with my cousin, Yasuo Inafuku (far right), and his wife, Aiko, waiting to greet us. Yasuo took us to our hotel on Kokusai Dori, and after we got settled, we went to the restaurant in the photo below to meet Choko for dinner. I didn’t get the name of the restaurant, but the food was delicious! Photo 4. 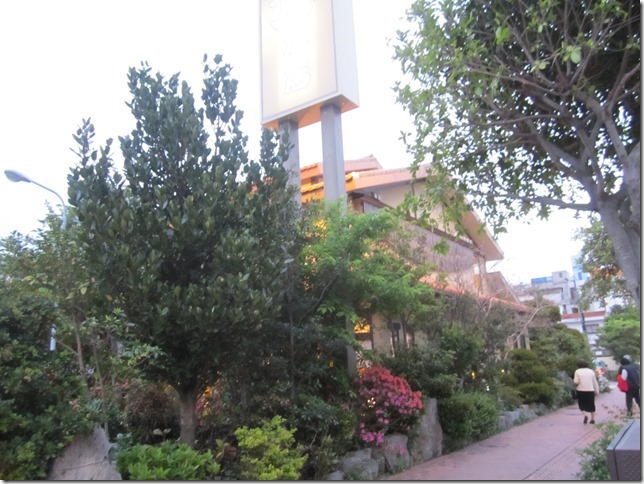 We had dinner at this restaurant with Yasuo and Choko. In the photo below, we are in a private room at the restaurant: Yasuo, Choko, Aiko, me, and Wei Wei. Photo 5. In a private room at the restaurant: Yasuo, Choko, Aiko, me, and Wei Wei. Below is a poster of the popular Okinawan music group Nenes who was performing at the Live House Shimauta on Kokusai Dori. I love their YouTube videos. 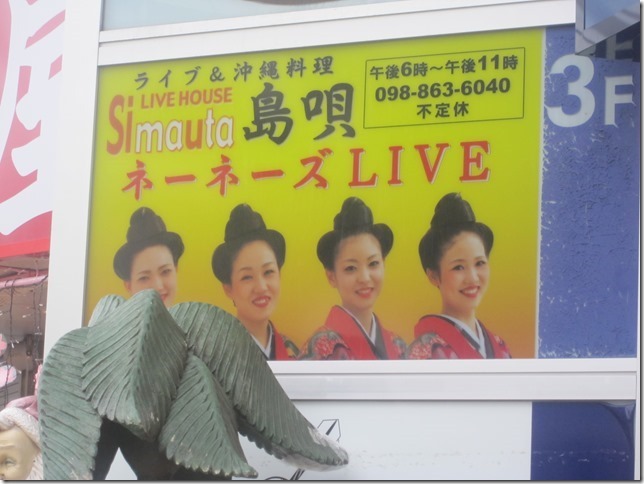 We were going to see them during our second night in Naha, but they were off. Sigh. So I just took a picture of their sign. Photo 6. A poster of the popular Okinawan music group Nenes. The day we were off for Nago, we first had lunch with Choko at the swanky Pacific Hotel close to the Naha waterfront. Below is a photo of me, Choko, Yasuo and Aiko before we headed for the buffet line. After lunch, a mature Okinawan gentleman came up to us with a woman associate and introduced himself to Choko. As one who worked in the agriculture industry, the gentleman said that he had spent time in Hawaii studying pineapple. Since my uncle Raymond Inafuku worked for Dole Corporation as a chemist, I wondered if he knew my uncle. Unfortunately, I didn’t get to ask him. Photo 7. We had lunch at the Pacific Hotel close to the Naha waterfront: Yasuo, Aiko, me, and Choko. 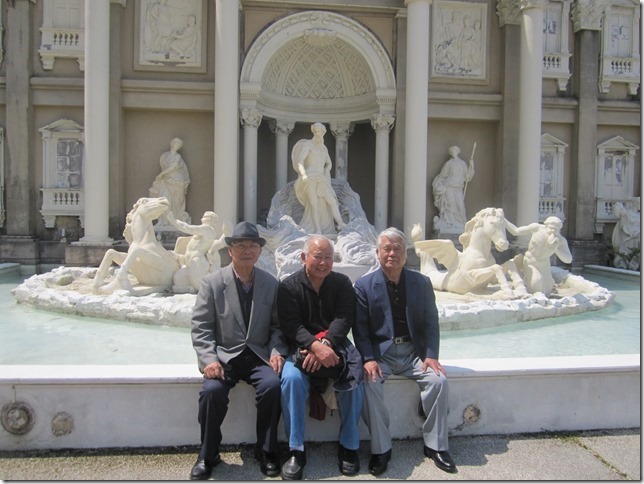 In the photo below, Choko , Yasuo, and I are in front of a replica of the Trevi Fountain next to the Pacific Hotel. Ho! I felt like we were in Rome! Wei Wei and I visited the original fountain last year. I think some well-to-do Okinawan really loves Italy. Photo 8. Choko, me, and Yasuo in front of a replica of the Trevi Fountain next to the Pacific Hotel. After lunch, Yasuo drove us up to our hotel in Nago where we dropped off our bags. We then went to Meio University in Nago where we met professor Kinuko Maehara Yamazato, who is with the university’s Language Learning Center. The Center is in a brand new building where the picture below was taken. Photo 9. 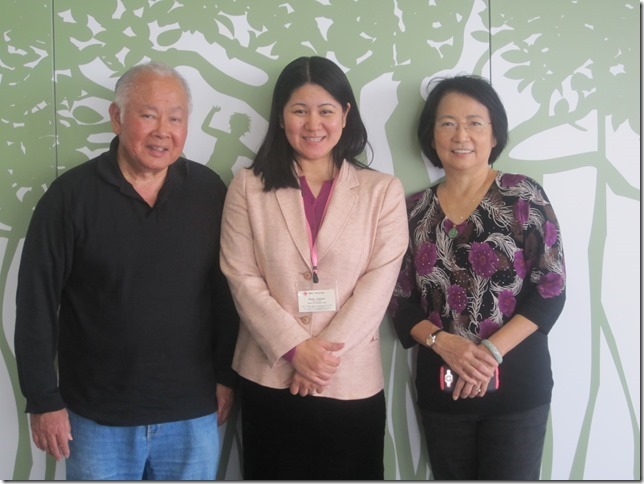 In Nago, Wei Wei and I met Professor Kinuko Maehara-Yamazato, who is with the Meio University Language Learning Center. Besides meeting Yasuo and family, our primary reason for going to Okinawa was to pay our respects and express our gratitude to my Inafuku ancestors. After passing away in Honolulu, my Baba’s (grandmother’s) ashes were brought back to Haneji and placed in the family tomb. 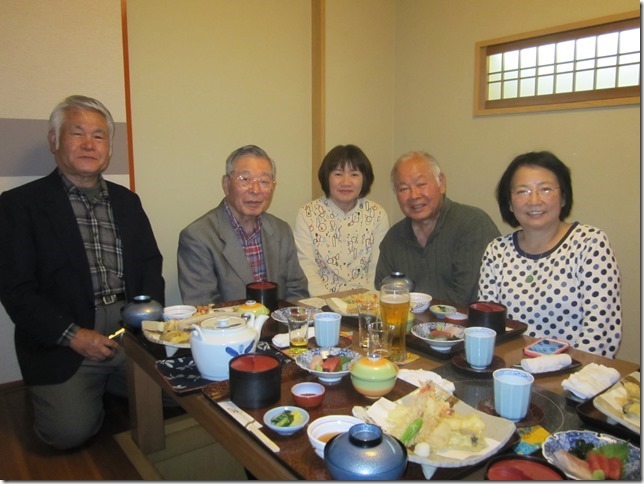 I also thanked my dad’s uncle, Hoso Inafuku, and his wife, Kama (Taira family), for raising my dad while he was in Okinawa in the early 1920s. I know they came to love him as a son as they never had any kids. 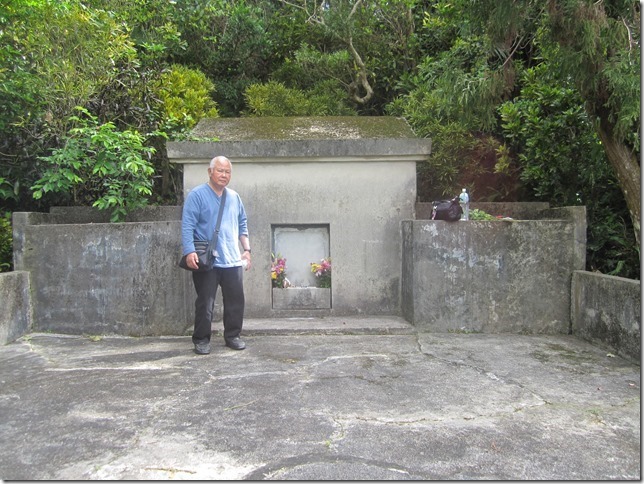 Below is a photo of me at the Inafuku family tomb, which is located on a hill in Haneji. Takao village is close by, down the hill on the coast. Photo 10. I’m at the Inafuku family tomb, located on a hill in Haneji. Walking down from the Inafuku family tomb back to the car, I saw an elegant tomb along the way. I asked Yasuo if he knew whose tomb it was. He said it was Aunty Kama Inafuku’s Taira family tomb. Aunty Kama, uncle Hoso’s wife, was a Taira. Photo 11. 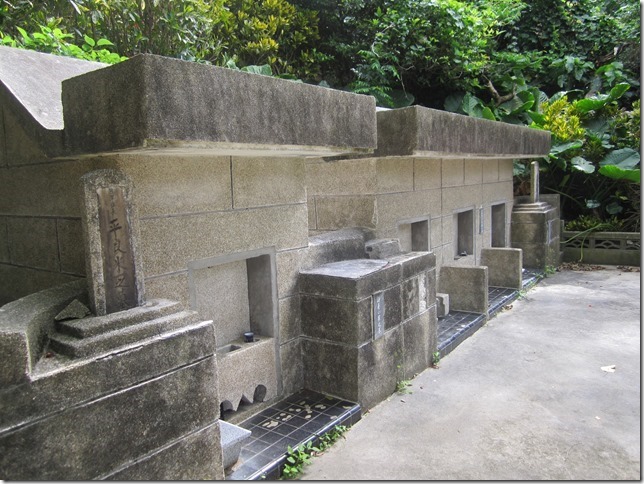 Aunty Kama Inafuku’s Taira family tomb. The next day, Yasuo and Aiko drove us to the airport, where we boarded a plane for Taiwan.